Use this paper with anaglyph red-cyan 3D glasses: draw on it with a thick black pen, and your drawing will appear to float above the paper. 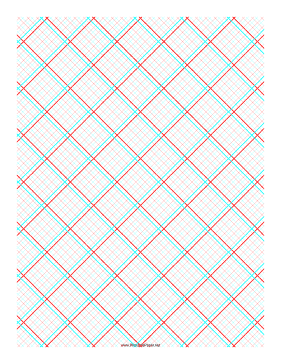 This 3D paper features a five line-per-inch grid with a relatively large offset between the two different colored grids. The large offset can create the deepest 3-D effect (compared to the small and medium offset variations) but for some viewers is less enjoyable and causes more eyestrain.